E-commerce retailers know that getting customers to successfully complete the checkout process without abandoning it half way through is one of their biggest challenges. Studies show the average online shopping cart abandonment rate is almost 70 percent. What’s more, 61 percent of shoppers cited high shipping costs or other extra costs as the reason for cart abandonment. According to a Shippo survey, nearly 34 percent consumers said they would purchase online only if shipping is free. With customers getting used to the convenient, fast and free shipping policies of e-commerce giants, smaller e-retailers are having a tough time competing. A good shipping strategy can play a major role in driving up sales and improving your customer’s buying experience. Not all customers expect fast and free shipping. While some shoppers will prefer free shipping even when it means they will have to wait longer for their goods to arrive, others will gladly pay a few extra dollars to for faster, guaranteed delivery. Offering a mix of both these variations on your site will allow you to satisfy everyone. Make sure you provide accurate and complete information about the expected shipping time and costs upfront, well before the final checkout. Unexpected shipping charges that pop up right before checkout automatically lead to a greater number of abandonments. So do exceptionally long delivery times. The Shippo survey found that 86 percent of customers wouldn’t return to a site if delivery time is too long. Providing a good overall customer experience helps ensure repeat purchases and loyalty. You can encourage customers to return to your website by offering low-cost shipping upgrades with one-time registration and payment. Amazon’s Prime membership is a great example of such a program. By paying an upfront membership fee, prime customers get special benefits such as free shipping, same day delivery, shipping upgrades at a reduced cost and much more. A common mistake that retailers make is overlooking their return policies. The Shippo survey found there is a huge gap between what retailers offer and what customers expect when it comes to return shipping. Only about 14 percent offer free returns and 60 percent make no effort to help their customers return goods. Take a cue from companies like Zappos which has earned a huge customer following through its 365-day free return policy. Experts say that sometimes customers order three or four shoes from Zappos, and return all but one. They come back for more purchases because of this flexibility. E-commerce retailers can make a lot of savings behind the scene. Choosing shipping carriers is one fairly untouched area in this regard. 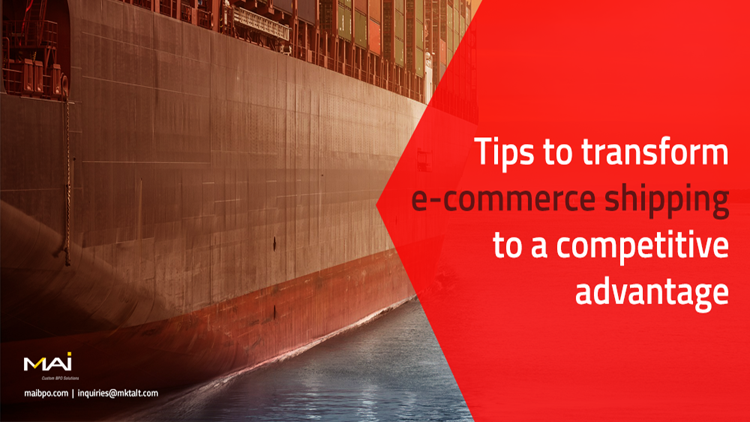 Most retailers make the mistake of choosing and sticking to a single shipping carrier. The truth is that nearly 94 percent of e-commerce customers don’t care which carrier is delivering their package. Most e-retailers only show shipping rates and delivery times, almost never the carrier. So you could experiment with different shipping carriers for different kinds of products, locations or sizes and potentially save money. A good e-commerce experience is not complete without a seamless shipping, delivery and return system in place. So develop and use a strategic system to drive sales, encourage loyalty and save money in order to gain a competitive edge in the ever-growing e-retail market.